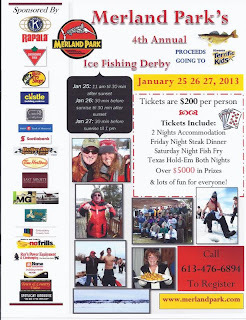 Ontario Fishing Directory - Lures and Tours Blog: Merland Park Sets 2013 Ice Fishing Derby Dates! MERLAND PARK’S 4TH ANNUAL ICE FISHING DERBY DATES HAVE BEEN SET! 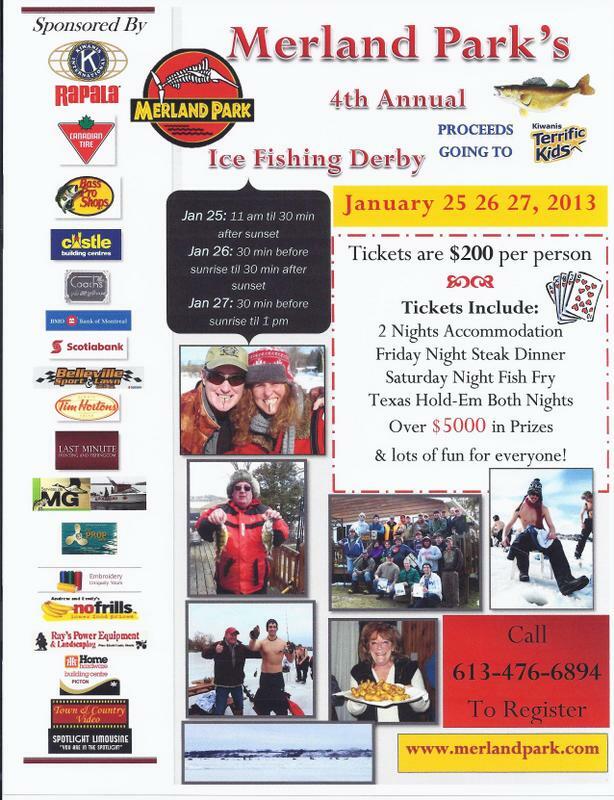 Merland Park’s 4th Annual Ice Fishing Derby is set for January 25, 26 & 27, 2013. Save the date! The number of sponsorship spots for this event are filling, the prizes are coming in, and the cottages are being booked! Proceeds from Merland Park’s 4th Annual Ice Fishing Derby are going to the Kiwanis Club’s Terrifc Kids Program again this year. Merland Park, a small quiet resort with nine modern cottages and three motel units, is located on over 3 acres of beautiful trees and laneways. Nestled on the shores of Picton Bay, Merland Park is just 1 km east of Picton, Ontario on Highway 33 in Prince Edward County. Merland Park Cottages on the Bay resort is extremely popular with anglers and their families. You may have even seen Merland Park Cottages on the Bay profiled on one of your favourite TV shows,or seen it as a setting for photos of many celebrity anglers and hunters. Find out more about Merland Park Cottages on the Bay on their Lures & Tours listing page.